on March 26, 2019, 12:49 p.m. While most Singaporeans own credit cards, very few are in debt from them, the latest YouGov Omnibus research finds. 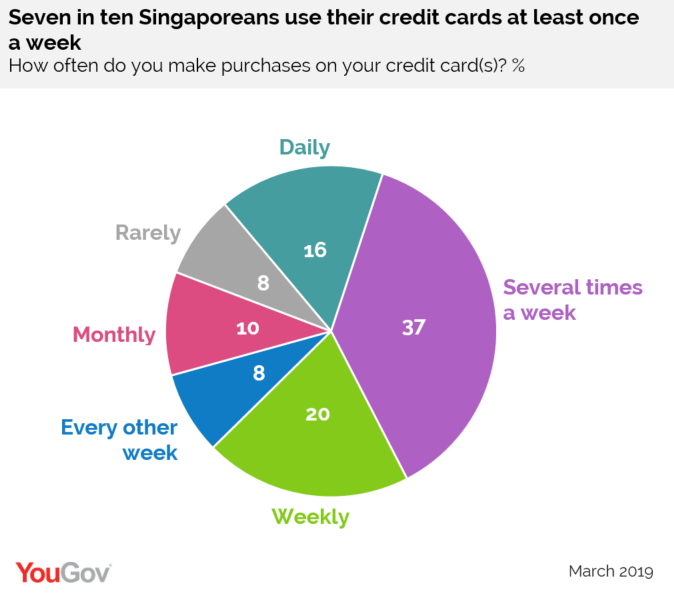 YouGov’s data shows that three quarters (73%) of Singaporeans own at least one credit card, while over half (56%) own more than one, and 10% holding six or more. The research reveals that the more a person earns, the more likely they are to own a credit card. While over half (55%) of those on a household income less than SGD 4,000 have a credit card, this increases to nine in ten (90%) among those with a household income of SGD 8,000 or more. However, while ownership is high, credit card debt is notably low. Among those Singaporeans who own one, the overwhelming majority (88%) pay off the total outstanding amount on time. Only one in eleven (9%) pay it off partially, while the remaining 3% pay off the minimum amount. 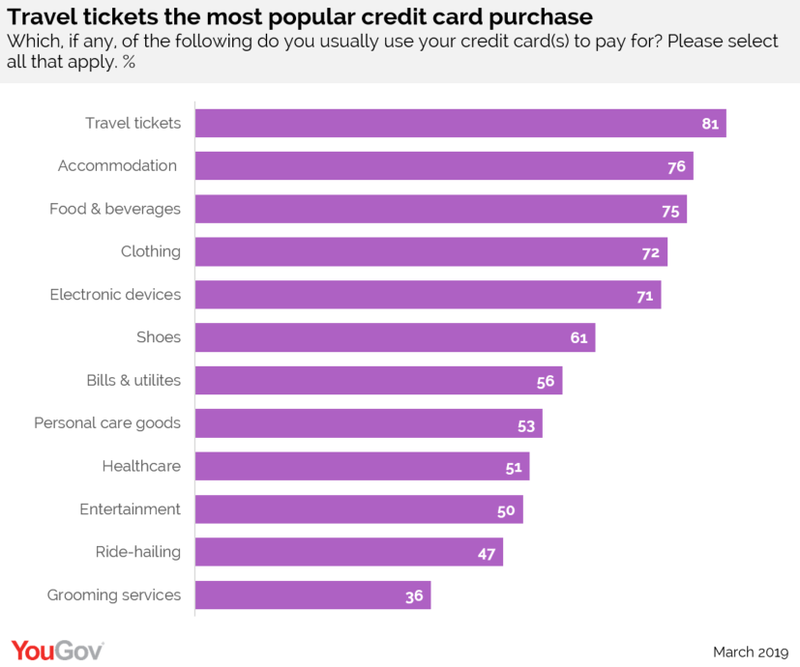 Travel tickets (81%) are the most common thing people use their credit cards for, followed by booking accommodation (76%). Other popular purchases include buying food and drink (75%), clothing (72%) and electronic devices (71%). Women are much more likely than men to use their cards for personal care goods (64% vs 43%), while men are more likely to use them for electronic devices (76% vs. 65%). Younger Singaporeans (aged 25 to 34) are more likely than older Singaporeans (aged 55 and above) to use their credit cards for ride-hailing apps (65% vs. 35%), while older Singaporeans are more likely than their younger compatriots (aged 18 to 24) to use their cards for healthcare (58% vs. 26%). YouGov’s research reveals how regularly Singaporeans pay by credit cards. One in six (16%) use them daily, while over a third (37%) do so several times a week. One in five (20%) swipe their cards on a weekly basis, and less than one in twelve (8%) make purchases on their cards every other week. One in ten (10%) use their cards monthly while the remaining 8% rarely use their cards. The data shows that while half (52%) of Singaporeans believe it makes good financial sense to have a credit card, a similar percentage (57%) think that they promote excessive spending.